Senior point guard Joe McDonald sets up a play guarded by Rhode Island's Jarvis Garrett. 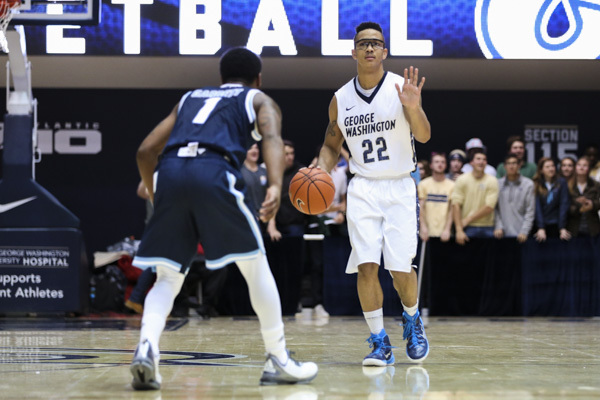 McDonald made his return in GW's win Friday after missing the previous two games with an eye injury. In the postgame press conference after GW’s win against Duquesne earlier this month, senior forward Kevin Larsen spoke of his classmate Joe McDonald, who had left the game with an eye injury that would keep him out of the following two contests. “He’s our most important guy,” Larsen said. Most important? At that point, McDonald was averaging 7.9 points and 5.8 rebounds per game. He was shooting below team averages from the three-point range and the free throw line. Sophomore guard Paul Jorgensen and Larsen had more assists. Larsen and Patricio Garino had more steals. Most important, glue guy, call McDonald what you’d like. Look no further than GW’s win over Rhode Island Friday for evidence: After GW’s three starting forwards combined for 70 percent of the team’s points in the two games without McDonald, the Colonials responded to his return with a complete team performance. “Joe’s kind of a calming influence on us,” head coach Mike Lonergan said Friday. GW’s starters averaged 31.8 minutes each in a game the Colonials led for only five minutes and 13 seconds. Six Colonials scored seven points or more. GW played some of its best team defense. The prime example was the job McDonald and Co. did on point guard Jarvis Garrett, an athletic driver who was as big a concern in Foggy Bottom entering the game as the pre-blizzard line at Whole Foods. “I was so worried about him getting to the basket,” Lonergan said. Garrett led the Rams with 15 points, including 3-for-5 shooting on three-pointers, but scored only five in the second half. Garrett entered the game having shot the most free throws on the Rhode Island team and collecting 2.4 assists per turnover. He wound up 0-for-1 from the stripe with two assists and two turnovers Friday. Garrett’s footspeed should have made him a tough assignment for McDonald, but he didn’t do much damage with his legs thanks to the effective help defense. He had a chance to respond for the Rams after Patricio Garino put GW up 57‒55 with one minute and 32 seconds left. He’d tallied an assist on the play before, getting in front of McDonald on a baseline drive that set up his pass to forward Earl Watson who laid it in. 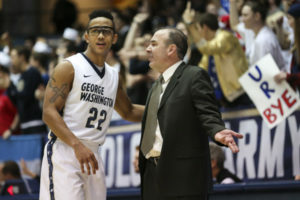 Head coach Mike Lonergan talks to senior point guard Joe McDonald during a timeout in GW’s win over Rhode Island Friday. Lonergan said McDonald has a “calming influence” on the team. This time GW was ready for the drive. McDonald held Garrett in place, guarding against the pass as the shot clock shedded seconds, until Garrett was forced to make a move. With McDonald up under him, Garrett thought he could cut around him and to the rim, but Cavanaugh stepped out from under the basket to deny the straight-line drive. Garrett tried to turn when Cavanaugh cut off his path to the basket, and McDonald caught him off guard and came away with a steal. GW got the stop, kept the lead for good and won, having overcome an 18-point deficit along the way. Garrett had helped get the Rams up big early, hitting wide open threes during Rhode Island’s fast start when GW looked late, lazy and lost, particularly on defense. The Colonials pulled out of the hole with a 17‒4 run to end the first half which included two high-difficulty layups from McDonald, knifing through the Rhode Island defense that wasn’t allowing GW, which had only four assists, to set up its offense. For a player who likes to say that he takes what defenses give him, his finish of a reverse move through traffic didn’t exactly come wrapped up with a bow on top. McDonald played the game with protective glasses on to shield his eye. “It’s better,” McDonald said after the game. He was cheery as he said it, and Lonergan glanced over at his face and smirked. The swelling is gone but a portion of McDonald’s eyeball was still bright red. “Ah, I know,” McDonald said, his team back together again.